A depository for information on the history of fishing tackle. I was very interested to read the section on the Cascapedia reels in John Drewett’ s book on Hardy Brothers. I am particularly interested in the comparison between these reels and with similar reels being made by the Edward Vom Hofe company around the same time. John mentions the Tobique River reel sold at auction in America during November 1993 and having known about it for some time I decided to do a little more investigating. 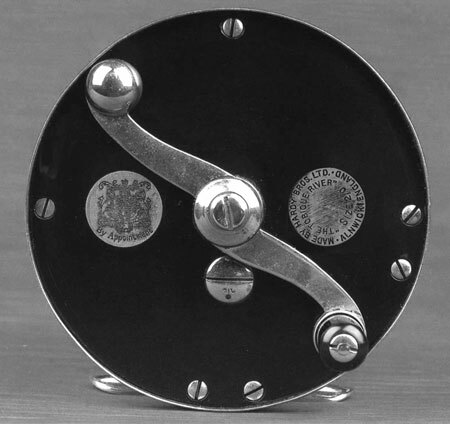 The reel was a size 2/0 and only had two medallions, the Royal Warrant by Appointment and the model designation. The medallion with the Prince of Wales feathers was omitted. This Royal Warrant was granted in 1931, one year before the Cascapedia was launched in the Hardy supplement. My guess is that the Tobique River reel was made in 1930 or even 1929, it would require many months if not years to produce a new reel This reel is certainly the prototype or first production model for the Cascapedia. Edward Vom Hofe had launched the Tobique reel in about 1928 claiming that it was the world’s first multiplying action reel with the winding handle centrally located. We can only speculate as to the reaction of the Vom Hofe company on seeing the appearance of the Tobique River reel. Panic, shock, indignation – who knows? Or what about this as a theory, Hardy Brothers and Vom Hofe worked on producing the reel as a joint venture? “No chance” you might say. Well let us look at the evidence. The Tobique and the Cascapedia share the following features:- “S” shaped handles, handles mounted within a handle guard, oiling ports on the back plate, indicating dots for the drag system and roller bars. Finally both reels were made of ebonite, German Silver and Duralumin. With one exception no other Hardy reels produced had any of these features. The exception was the New Brunswick, a variant of the Cascapedia, introduced in 1935. 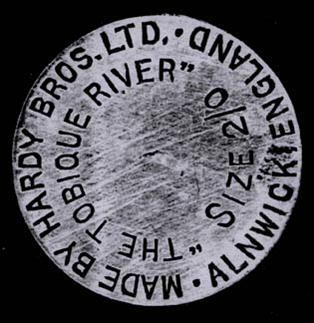 This was the Hardy equivalent of the Restigouche single action fly reel. There were only two of these reels made according to the production book. So with both companies having decided to develop the reel someone chose the project name “Tobique” the man from Hardy asked what that was and Vom Hofe said that it was a river. Vom Hofe built the Tobique and Hardy the Tobique River. Once the reels were finished they could not be called the same name so Hardy changed theirs to Cascapedia named after another river and also an earlier Vom Hofe model. Far fetched! Well we have the reel as evidence. The reel or reels, who knows how many were made?, ended up being used. The one sold at auction belonged to Ed Zern. I did not know who the gentleman was and asked a few people if they knew anything about him. What I learned was that to many people he was like a member of the family. One person told me how, as a youngster, he always looked forward to the arrival of his dad’s Field & Stream. Even if the front cover story was, “How I beat off a 10 foot renegade Grizzly with a Spatula, whilst landing a salmon”, he would always turn to the back page to read Ed. Zern’s column first. I managed to get hold of some of his books and he was without doubt a very fine writer with a wonderful sharp wit. Nick Lyons wrote a fine tribute to the man in the magazine Fly Fishing in 1994 and pointed out some of his observations on fishing. It was the story of his meeting with a man named Thompson that first appeared as “A Day’s Fishing” in 1948 that was his favourite. He was pointed in his direction during a particularly poor days sport, but was warned that if ever there was a contest for the most unpopular man he would win it easily. He then tells us about the fishing and the fish that he caught. About a day’s fishing, what some of us still try to do, pleasant, rewarding, solitary and uncomplicated. A break from normal everyday life and the pace that it is lived at. Thompson then brings out a chocolate cake, says “There’s cake.” Ed waits to see if he wants to “pursue the subject” then asks directly if he might have a slice of it. Was it cooked by a neighbour? “I do my own cooking” says Thompson. Then they part with Ed asking if he could come back some day and Thompson saying “I guess so” but it would have to be alone, he didn’t want “all creation tramping across them fields”. As Ed is turning his car out of the driveway Thompson calls him and walks over to him. “You can bring someone, if you want” Ed thanks him and says that the first chance he gets he will be back but he will only bring someone who has milked a cow. He means to go back but never does. It is the same with us. We move on and special days like that one are all too often forgotten, missed or trivialised. The last few years of his life were rough for him and when he died in March 1994 many thought that it was a blessing. As the nurse wheeled him out of the rest home on the way to the hospital he asked the nurse where he was going, the nurse said “On a fishing trip, Ed” Shortly after he slipped into his last coma and died. So there we have it a unique reel that was for a time in the possession of a unique man. This entry was posted in Hardy Brothers, Hardy Reels, Reels. Bookmark the permalink. always love hearing more about ed zern. have two of his saltwater fly rods still in use. the spool on retrieve runs counter to the turn of the handle allowing the line to enter at the top of the spool. did they fish with the reel on top in the 20’s and 30’s? Many fishermen did actully like to fish with the reel on top of the rod…Those reels had 2 rolling pillars at the right side when you look at the reel standing at its reelfoot and only one pillar at the left side. Do not make more filosophi out of Hardy and there Tobique or Cascapedia reels! They where only made to attac Edward vom Hofe`s 504 Tobique…Hardy made a big mistake making those flopreels and they had to cansel most production becaurse it was the EVH reels people wanted to buy…Also the quality was unbeaten in a EVH reel! The 1925 Edward vom Hofe Griswold was made to be casted under the rod but turned at the top when a fish had to be fighted! Ever Ready German tackle maker.